Your slice of paradise in the French countryside, only 8 minutes from Lectoure! 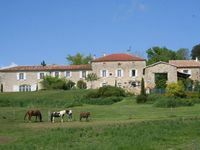 Property 4: Your slice of paradise in the French countryside, only 8 minutes from Lectoure! From the Oppidum of Layrac Poney Club, spectacular view of Gers and Garonne. Property 44: From the Oppidum of Layrac Poney Club, spectacular view of Gers and Garonne. Located in a peaceful environment, this pretty cottage ensures you a stay while peace of mind! Property 49: Located in a peaceful environment, this pretty cottage ensures you a stay while peace of mind! This large 3 bedroom apartment, renovated in a rustic, modern style, is part of a domaine, a small complex of buildings and land, which includes the owner&rsquo;s house and another rental, on a large property with a spectacular view of rolling hills and the Pyrenees, on a clear day. It is no longer a farm and is located outside the ramparts of a tiny village. Nearby commerce is in Condom close by (less than 10 minutes by car). I found this location very convenient to other towns of interest as well. The house has everything one could need&mdash;ideal for a family or several couples&mdash; and the large swimming pool and gardens must be wonderful in the summer. I was there in February-March, which required heating /electricity, so charges for that were additional. Nice linens are available for an additional fee also. Where to start? Anne &amp; Christophe live in the farmhouse just down the road and were very helpful and accomodating. The house and property is an absolute dream. Our family of 7 (5 kids) were so comfortable we could have stayed forever. Anne is very talented and has restored the property and home to perfection. We loved everything about Gite de Montastruc, especially our hosts and hope to go back soon.